Two of the most crippling aspects of living with debt are garnishments and liens. 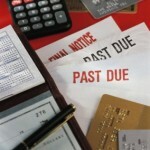 A garnishment is a usually mandated court order in which a part of your paycheck is withheld to be put towards a debt. Garnishments often continue until the entire debt is paid, or some arrangement is made to pay off the debt. Unpaid court costs, child support, unpaid student loads, and taxes are common examples of debt that can be paid via garnishment. Federal law prohibits a garnishment from taking whichever of these amounts is less — 25% of your disposable income or the amount that that your income exceeds 30 times the minimum wage. A lien acts as a security for an unpaid debt and is often placed on a home, which gives the creditor a stake in the property. When a lien in placed on a home or other property, that property can’t be sold until the lien is paid. It also interferes with your ability to take out a second mortgage or obtain a home-equity loan. In some cases, filing for bankruptcy may help eliminate garnishments and liens, helping you reclaim financial autonomy. To learn more, call the law offices of George R. Belche today and schedule your free initial consultation. Entering 2019 With Credit Card Debt From Years Past?